Between the trade deadline, the Rising Stars game and the All-Star break, it's been almost a month since we've done a traditional Rookie Rankings. And, boy, did we pick a good time to jump back in. That's Pretty Interesting: Can Spurs save sinking season? Rookie of the Year favorite Luka Doncic has received some stiff competition as of late, particularly from Hawks guard Trae Young, who has become must-watch entertainment for a suddenly very promising Atlanta squad. Young was so great this week that he took the top spot in the rankings, so often occupied by Doncic. Much more on his rapid ascent below. Another rookie making some serious noise is Sacramento forward Marvin Bagley, who put together a string of phenomenal games this week before suffering a knee sprain. And while the injury to Jaren Jackson Jr. will unfortunately keep him out a while, that opens the door for more rookies to get into the rankings, which is always fun as the season heads into the home stretch. The Trae Young Show has officially arrived in the NBA. Every wildest hope and lofty ceiling regarding Young came to fruition in four games over the past week, as the 20-year-old set career highs with 36 points and eight 3-pointers in a loss to the Rockets, then followed it up with 36 again in the very next game -- a comeback win over the Timberwolves. Young has been brilliant, but the key is that instead of his increased scoring hindering his playmaking and passing ability, it's actually bolstered it. Teams have occasionally been throwing soft traps at Young (not uncommon for point guards of his size), and since he's been so good at throwing lobs to rolling bigs, teams have cut off the lane as well. So what has Young done? He's been patient, flinging cross-court lefty passes on time and on target to waiting open shooters. Young probably won't average 30 points per game for the rest of the season, but he's shown that he can be a consistent scorer, shooter and playmaker while leading his team to wins, and that's a terrific sign for the Hawks. It's hard to imagine that averaging a near triple-double with 27 points per game would land you in the No. 2 spot, but that's just how good Young was this week. Doncic gets bumped down a peg for missing the first two games after the break due to an ankle injury and some uncharacteristic turnover issues once he returned (16 in two games ... yikes). That being said, he was still brilliant in those games, and was clutch in the fourth quarter of the Mavs' win over the Pacers on Wednesday, putting up nine points, three assists and just one turnover in the period. The Kings and their fans breathed a sigh of relief on Thursday, as Bagley's knee injury was diagnosed as just a sprain. The big man has been on an absolute tear since the All-Star break, averaging 24 points and 11.7 rebounds in three games before exiting early on Wednesday. He's been a force inside regardless of opponent, skying for rebounds and playing with relentless energy. Bagley's sixth in the NBA since the All-Star break in offensive rebounding (4.3 per game) and his boards in traffic have been particularly impressive. Another positive sign is that Bagley has now made at least one 3-pointer in four of his last six games. Don't expect him to be a 40 percent shooter any time soon, but if he can at least be a threat from deep he'll be even more difficult to contain offensively. Ayton has been the pinnacle of consistency in three games since the break, putting up 13-9, 14-12 and 14-10 lines in three games. He's still incredibly efficient from the field, but the Suns are such a mess that it's hard to get a good gauge on how the No. 1 overall pick is progressing. It's a bit troubling that Ayton has failed to pick up a single assist in four of his last six games, particularly after the Suns started the season using him as a facilitator at the top of the key. Brunson has seen increased minutes since the Mavericks sent Dennis Smith Jr. to New York, and he's made the most of them. Brunson has been incredibly efficient offensively, shooting 53 percent from the field and 50 percent on 4.5 3-point attempts per game this week. He's not a born distributor, but he doesn't need to be when Doncic is on the court with him. It was clear from the beginning of the season that Brunson would be a player in this league for a long time, and now we're getting to see what he can do with a more consistent role. Is that Mitchell Robinson or Hakeem Olajuwon? We kid, but Robinson has been a revelation for the Knicks in the absence of DeAndre Jordan. He put his name alongside legendary big men Yao Ming and Tim Duncan by becoming the third rookie in the past 25 years to post a double-double with at least five blocks in consecutive games, and Mitchell has been the definition of an eraser on the defensive end. His four blocks in 42 seconds against the Magic was one of the most impressive feats of the season. At this point the only hindrance to Robinson's dominance is his inability to stay out of foul trouble, but he's been improving in that department as well. Trier has been boom-or-bust all season, and that's continued after the All-Star break. 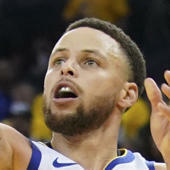 He sandwiched great games against the Timberwolves and Magic (19 points per game, 11-for-16 shooting) with a 3-for-10 shooting performance against the Spurs, and had his highest scoring output in over a month with 22 points in a loss to the Cavs. Pretty much anything Trier gives the Knicks is found money at this point, so they won't be complaining, and his consistency will likely come as he progresses through his career. Sexton continues to struggle from the field, but his 3-point shooting has been a pleasant surprise this season. He hit 39 percent of his attempts this week, and took nearly six 3-pointers per game in February after averaging just 3.5 attempts in January. In fact, Sexton has increased his 3-point volume every month since he's been a pro, while maintaining good proficiency. Now if he can just improve on his 2-point efficiency and his assist totals, he'll be in business. Like so many wing players, a good sign of Knox's engagement is his rebounding. He hasn't shot well at all since the break, but he's been helping the team by hitting the glass, notching over five rebounds in each of his last five games, pulling down 10 twice. He's still not getting others involved offensively, but if Knox can continue to rebound the way he has recently, it will make a lot of those horrific shooting nights easier to swallow. Once the No. 1 player in his high school class, Giles' career has been marred by injury, so it's good to see him having success with the upstart Kings. He put up big production on nearly 60 percent field-goal shooting this week in under 17 minutes per game, but should be in line for more playing time with Bagley out for at least a couple of weeks. He plays with energy and confidence, so it will be fun to see how Giles handles an increased role.